Street banner jobs run the gamut from single design, one color screen prints to 1600 banners of 5 different designs (more on that soon!) to 89 different digitally printed designs. When Kits House, West 4th Avenue BIA, and other Kitsilano associations ran the “Kits Me” banner contest, we got the pleasure of sorting out the winners of the story contest and putting their photos on one of seven colour backgrounds. 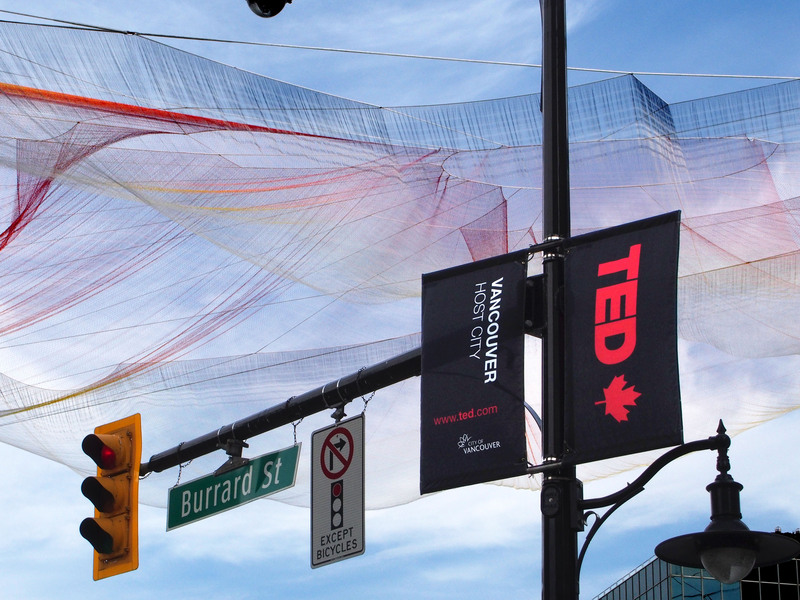 This was an ambitious project on our end since it required some meticulous planning to organize that many different design files, get them printed, and then make sure they made it up on the correct pole (we tried to honour people’s requests to put their banner in certain areas of 4th Avenue if at all possible). 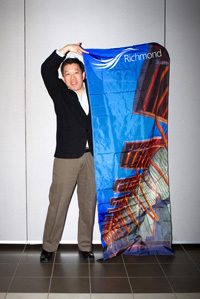 The banners were printed on Echotex®, our 100% recycled banner fabric. See our full Facebook gallery here along with a map of who’s located where. There are still a few banners missing but we’ll add them soon. 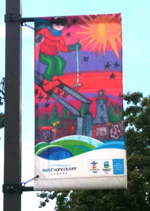 The banners are up now until the end of October and after they come down, the participants get to keep their banner. If you think this contest was cool, watch this space for more details. 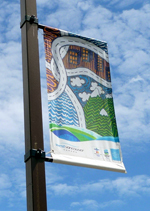 You might get a chance to get your own street banner on 4th! West Vancouver recently received recognition from the United Nations as a Global Green City – something we do not find at all surprising here. 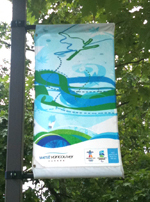 When the Vancouver 2010 Olympic banner program was being finalized, West Vancouver decided opt out of the bulk order that VANOC was place and instead have their Olympic banners printed on Echotex (our 100% recycled banner textile), as part of their committment to sustainability. Naturally, this enthusiasm for the environment has bled over into other aspects of their municipality and now they have the official recognition to prove it. On April 8th in New York City, the United Nations awarded West Vancouver a Medal Certificate and recognition as a Global Green City. So congratulations, West Van! Keep up the good work. 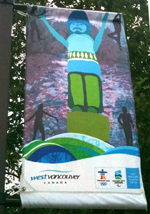 Read about West Vancouver’s award here. Here at The Flag Shop, we aren’t great at sticking to the status quo – it gets boring. 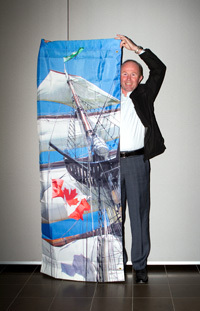 I mean, we love flags and banners – we really do – it’s just that sometimes we like to branch out a bit. Sometimes this means adding new products to our catalog, but sometimes it means finding a fabric no one else uses and then making it our own. Of course, we’re talking about Echotex – our 100% recycled banner fabric. 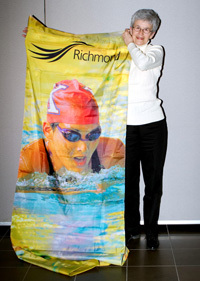 Back when the Olympics were just in the planning stages here in Vancouver, Susan got it into her head to do something totally new and bring in a “green” flag and banner textile. Now, Susan is known as a super-sleuth for finding suppliers, but even so, she couldn’t find anyone offering recycled fabric for printing banners. Of course, that wouldn’t do. 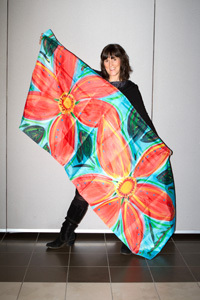 After searching around, she found someone who could manufacture the fabric she wanted and Echotex was born. 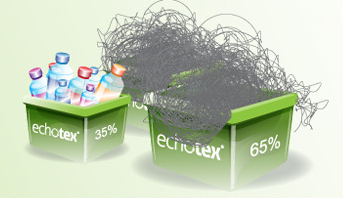 Originally Echotex was made of a mix of 80% pre-consumer and 20% post-consumer waste. The pre-consumer bits are things like scrap polyester from the cutting floors of other textile plants and the post-consumer items are recycled plastic bottles. After a recent re-certification (and who doesn’t like certificates), the mix is now 35% post-consumer and 65% pre-consumer waste – so more plastic bottles are in the mix and not in the landfill! Read more about Echotex® at our site – including some nifty graphics on how it’s made and who is using it.